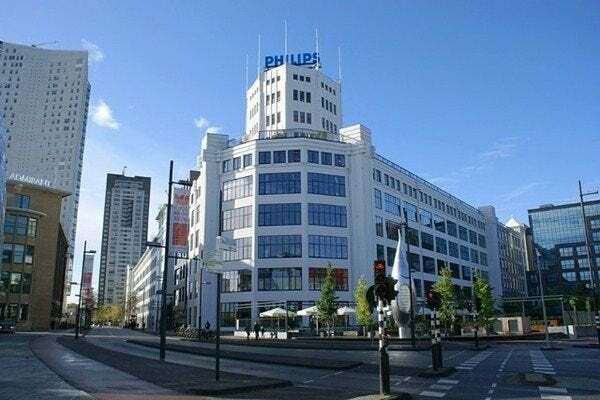 In the center located very exclusive apartment of 450 sqm with a magnificent panoramic view over the city of Eindhoven. This loft offers an unprecedented level of luxury and an optimal comfort ! A beautiful , custom closet serves as a dividing wall between the entrance and living room . Once inside you will be surprised by the spacious living room with magnificent views over the city . Flee to the order of the day you do in the western part of the loft which is decorated like a real gym with boxing ring and a closet . This case also serves as a barrier to the aft seating area. Right next to the boxing ring is located one bathroom with a sink , a urinal and shower with rain shower and hand shower . The living space is located on a small increase , it is equipped with a tropical hardwood floor laid in attractive design , with heating / cooling. Currently, this room is furnished as a lounge , study and dining area . The elevator shafts of the former Philips factory have been preserved and now serve as a library and wine room . Very tasteful , high gloss black kitchen layout . The kitchen is equipped with the following appliances : double sized fridge , freezer with integrated ice maker, steam oven, convection oven , plate warmer , dishwasher and sink. A werk-/kookeiland with stainless steel worktop , large 5 ring gas hob , integrated into the worktop extractor, a fixed table and a 2nd sink completes the whole. From the kitchen there is access to an alcove where a pleasant working area is created . Bedroom 1 with closet and bedmeubel equipped with an integrated guest bed , TV connection and direct access to the adjacent 2nd bathroom . This is a fully tiled in colorful mosaic shower room with designer vanity and shower with rain shower and hand shower . Large utility room with connections for the washing machine, sink , cupboard with extensive distribution and distribution unit for mechanical ventilation with heat recovery system . Above the entrance created ' floor ' which is decorated as the main master bedroom with adjacent bathroom and a walk-in wardrobe . The sleeping area is close to the living room on a lower level , down by heavy, dark theater curtains this room features a magnificent tropical hardwood flooring . The main bathroom has a wooden floor , double wash basin with cabinet design furniture, bath with waterfall and fully mosaic tiled large shower with rain shower and hand shower . There is a separate toilet with a sink and hanging closet . On the 6th floor is a communal lounge area situated with a bar and then a large roof terrace with stunning views over the city . The entire loft , including the raised flooring , underfloor heating connected to district heating , which also provides cooling if desired. In the equipment room / laundry room is a drain placed in the loft and has an air circulation system for continuous supply of fresh air present. In the loft includes 2 parking spaces in the basement of the lighthouse , and two lockable storage rooms .